1999's The Earth Pressed Flat finds 10,000 Maniacs exploring similar musical terrain as their previous album, Love Among the Ruins, on which singer Mary Ramsey debuted. Ramsey sounds less like a stand-in and more like a frontwoman on The Earth Pressed Flat, which was released on the indie label Bar None. Fittingly, the album sounds more folky and down to earth than some of their previous albums. The album was recorded over the course of four years at the group's home studio, on the road, and in traditional studios; it also incorporates recordings of found sounds and rehearsals for a dreamlike, fluid continuity. Ramsey's vocals sound at home in The Earth Pressed Flat's rustic, stripped-down settings, particularly on the Sandy Denny cover "Who Knows Where the Time Goes?" The title track and "On and On" also allow her vocals to breathe, with understated accompaniment from her fellow Maniacs on guitars and keyboards; Ramsey's own viola playing completes the picture. 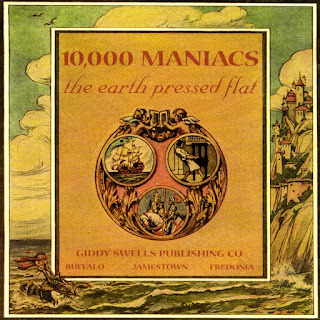 The Earth Pressed Flat blends old and new, ethereal and folky sounds into a style that is distinctively, yet differently, 10,000 Maniacs.